World's first rewireable Right and Left Angle IEC320-C13 connector (PA130100RBK). Any AC Power Cord 18~14AWG can be fitted with this connector. It is compact and will fit in the tightest locations. Available for purchase in single or OEM (volume) QTY's. World's first rewireable Up and Down Angle IEC320-C13 connector (PA130100DBK). Any AC Power Cord 18~14AWG can be fitted with this connector. It is compact and will fit in the tightest locations. Available for purchase in single or OEM (volume) QTY's. World's First rewireable Straight IEC320-C13 connector (PA130100BK). Any AC Power Cord 18~14AWG can be fitted with this connector. It is compact and will fit in the tightest locations. Available for purchase in single or OEM (volume) QTY's. This is the original IEC-Lock C13 connector. This is in stock at Webber Electronics in various common configurations. Browse our offerings and buy today. This is also available for quote form Webber Electronics on any North American or International AC Power Cable. Contact us today for a quote. This version of the IEC-Lock connectors offers an easy-pull unlock mechanism that is slim and highly visible. This is available for quote form Webber Electronics on any North American or International AC Power Cable. Contact us today for a quote. The IEC-Lock technology is also available in the IEC320-C19 configuration. It will accommodate higher wattage equipment with C20 inlets. This is available for quote form Webber Electronics on any North American or International AC Power Cable. Contact us today for a quote. Quick Ship & Made to Order IEC-Lock Power Cords. Many standard lengths and configurations ship from stock. 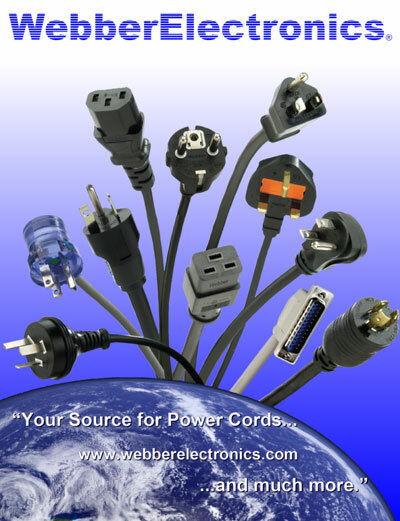 Browse our exitsing stock, or request a custom power cords. No MOQ, and most orders ship same day. This is the newest fully overmolded Up, Down, Right, and Left angled IEC-Lock C13 connectors. This is available for quote form Webber Electronics on any North American or International AC Power Cable. Contact us today for a quote. A total of seven new products have been added to the innovative and award-winning IEC Lock™ range, which build on the features of existing products to satisfy customer demand and complete the range offer. IEC Lock™ is a unique mechanism for locking IEC Connectors and is designed to provide protection against accidental disconnection of computer equipment, servers and most network devices by way of a unique and patented locking mechanism. Four new molded angled IEC Lock models have been introduced as a direct result of numerous customer requests for a smaller, more versatile version of the existing C13 IEC Lock+ that can fit into tighter spaces. The new range comprises a left angled C13 IEC Lock+, right angled C13 IEC Lock+, up angled C13 IEC Lock+ and down angled C13 IEC Lock+. They come with a two part handle located at the front of the connector to minimize the overall length of the connector, with the added benefit that the handle can be removed where space is limited. All four connector types share the same interface and locking mechanism components. Two new angled rewireable C13 IEC Lock+ Connectors – a right angle connector and a down angle connector – have been added, again as a result of increasing customer demand for a smaller version of the existing rewireable C13 IEC Lock+. They come with a two part handle located at the front of the connector to minimize the overall length of the connector and both share the same interface and locking mechanism components. The outer housings can be mounted in either orientation, which means the right angle connector can be converted to left angle and the down angle connector can be converted to up angle. A new compact version of the C13 IEC Lock+ completes the new product line up. With a reduced overall size – width, height and length – this is aimed at installations with restricted space, for example server racks and cabinets, and offers the original features of locking into compatible C14 sockets without the need for additional or bespoke hardware. Its distinctive red handle activates the release mechanism, and the twin-sided handle design means it is accessible from both sides of the connector. The introduction of these latest models will further enhance the IEC Lock portfolio, allowing us to continue to meet changing customer requirements.